Quality - How to know? Essential oils are volatile substances that can be found in various parts of aromatic plants and that, usually, are extracted by distillation processes. Each essential oils has a unique and complex chemical composition that defines its therapeutic properties. 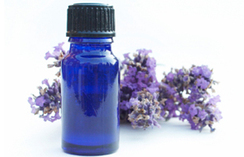 The beneficial action of the aromatic molecules that integrate essential oils is studied and applied by aromatherapy. Unlike synthetic drugs, good quality essential oils, when correctly used, don't have undesirable side effects and don't leave toxic traces in the organism. The natural biochemical language of essential oils is perfectly understood by our organism, which will positively respond to the application. The frequent use of good quality essential oils, promotes the action of the body's own healing system, stimulating and supporting our vital strength, our natural healing force. Through them, the entire human organism - physical and psychological, is strengthened and fortified, energized and revitalized, detoxified and purified. Medicinal plants have played a central role in the healing arts since early mankind. Aromatic plants and oils have been used for thousands of years for religious, medical and social practices, by all major civilizations. The traces are numerous and some of those ancient practices are still prevailing. In the East, for instance, springs of juniper are burnt in Tibetan temples as a form of purification, and in the West, frankincense is used by the Roman Catholic churches. Early fragrant oils were obtained mainly by maceration, expression and enfleurage methods rather than distillation, which did not widely occur until the 10th century. In the Vedic literature of India, dating from around 2000 BC, there's a list of over 700 aromatic substances, including cinnamon, spikenard, ginger, myrrh, coriander and sandalwood. In India, the understanding of plants developed into the traditional Ayurvedic medicine, which is still in vigour in the present days. The Chinese also have an ancient herbal tradition, with records dating from around 2000 BC. The use of medicinal plants is part of the Traditional Chinese Medicine procedure, and is related to the practice of acupuncture. While the chinese were developing the acupuncture, the Egyptians were acquiring the knowledge of essences. 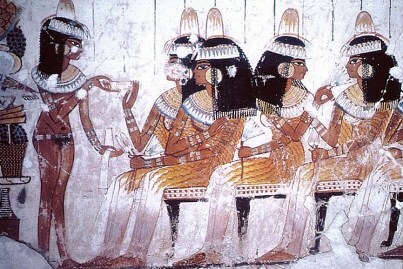 The Egyptian were highly knowledgable about medicine, perfumery and cosmetology and were famous for the use of aromatic substances. Egyptian alabaster vessels, dating between 3000 and 2000 BC, were believed to be used for scented oils. When the tomb of Tutankhamen was opened, in 1922, several vases and small pots were discovered, some containing unguent. The contents, which had solidified, contained traces of frankincense among other less identifiable aromatic substances, which were mixed in a base of animal fat. The tomb was sealed over 3000 years ago, but the scent was still detectable! The Egyptian aristocracy used scented unguents in the shape of a cone, that were placed in their heads and slowly melted and perfumed their bodies. Aromatics were also present in preparations for the next world. The natural antiseptic and antibacterial properties of aromatic gums and oils such as cedarwood, frankincense, pine and myrrh, make them ideal for preserving corpses and were used in the embalming process. In those times there was not a clear difference between medicines and perfumes, and one item often served both purposes. Kyphi was a very popular egyptian preparation made of sixteen different ingredients, including calamus, cassia, cinnamon, peppermint, juniper, henna, and raisins, among other. It could be used as an incense, perfume, or taken internally as a medicine and had the ability to relieve anxiety, brighten dreams and heal the soul. This preparation was later used by greeks and romans, who embraced the egyptian's knowledge about the use of essences, and further advanced the use of aromatics. Not to be left out, the Bible also makes reference to various aromatic substances. Frankincense and myrrh, brought to baby Jesus in the manger by two of the three Wise Men, might be the most notable of the aromatic Biblical mentions. Other fragrant oils and unguents are also mentioned in the famous book. As the Roman Empire begun to stumble, the civilization standards in Europe also suffered a general degeneration. During this phase, most of the knowledge about aromatics was lost for some time and was only "resuscitated" during the 16th century. This century was known as the "renaissance" age for aromatherapy and many books about distillation were written by then, specially in Germany. 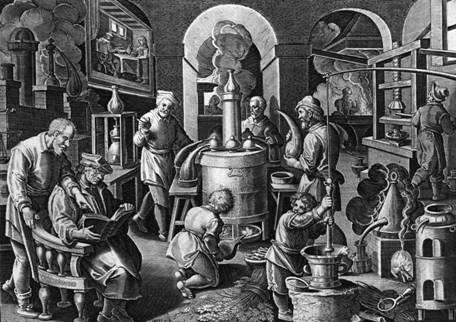 At this time, Alchemy was very popular, and the distillation of all kinds of substances was the alchemist's favorite occupation, in their pursuit of the quintessence of matter. Later, the 17th century was also known as the "golden age" of english herbalists. While Europe was going through the Dark Ages, the use of aromatics was flourishing in the Middle East, where Persians where perfecting the art of distillation. Avicenna, has been credited with the invention of refrigerated coil, considered a breakthrough in the art of distillation. However, a perfectly preserved distillation apparatus made of terracota, together with small perfume containers, all dating from 3000 BC, were found near Pakistan. This suggests that the process of distillation was simply revived or improved over a process that had been practiced over 4000 years ago... Of all the aromatics, the attar of rose was the favorite in the Middle East, and is still very important for the Islamic culture nowadays. By the end of the 17th century, a distinction was made between perfumes and the aromatics, that became the domain of the apothecary. Later, technical chemistry start taking the place of alchemy, and the idea of an inter-relation between matter, spirit, psychology and medicine, gave place to a new concept of logic and deductive reason. 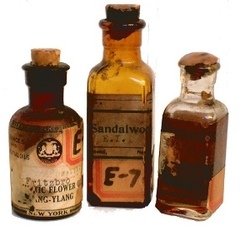 With the Scientific Revolution of the early 19th century, the scientists where able to start identifying the chemical constituents of essential oils, and they start giving them specific names like "geraniol", "cinéol", "citronellol", etc.. This enthusiastic research was the start for the development of modern synthetic drug industry. Gradually, a division occurred between physicians that used synthetic drugs and those who remain faithful to medicinal plants. Over the time, the medical establishment became obsessed with science and chemistry, and plant-based therapies began to be taken over by synthetic derived active constituents. Fortunately, in the late 19th century, some french physicians noticed the low incidence of tuberculosis in flower-growing districts. The first laboratory studies on essential oils were then made, which revealed the high antimicrobial activity of some essential oils found in medicinal plants. Since then, France is on the forehead of essential oil practices and studies. In 1937, the french chemist René-Maurice Gattefossé coined the term "Aromatherapie". "The use of aromatics is as old as civilization itself." - Battaglia S.